34 Response to "ready to eat? it's bead soup party"
The bracelet is gorgeous! I love it's bold style and unique design. Would love to see the necklace. These things happens - no worries! Post it when you get it done! The bracelet you made is lovely. Oh wow. . .that's a real shame that you didn't get your pendant back! I hope we get to see it soon. In any case, the bracelet is really beautiful so I know that necklace will be! You did a beautiful job! And I'm looking forward to your other piece as well. I'm so glad you participated, and I hope you'll join me again in the summer! Such an airy abstract feel to it. So nice! I look forward to meeting your necklace - if it is anything like your bracelet it will be awesome! Oh Nicki, das ist so schade mit dem Anhänger, aber dafür ist das armband traumhaft schön geworden. Klasse! I guess we have to expect the unexpected. At least you're safe, despite the flat tire etc. good work on the bracelet. Will look forward to seeing that necklace you'll be making. I love the bracelet, can't wait for the necklace! On the bright side your bracelet looks lovely and comfy too! I'll check back in to see your pretties. Hopefully he doesn't disappoint you a second time. Aaah! That necklace turned out spectacular! Loved stopping by and looking forward to watching your work! Good work. I know about life getting in the way of beading. Cool bracelet. I'll be back to see your second piece. I love the piece that you created! What a beautiful bracelet. That's a lovely bracelet, and the clasp is gorgeous. I hope you get the stone setting back soon! your website, I really like your technique of writing a blog. a new reader. What could you suggest in regards to your post that you simply made a few days in the past? Thanks for finally writing about > "ready to eat? 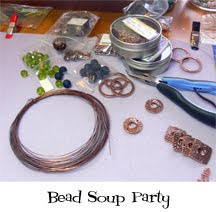 it's bead soup party" < Liked it! Haven't heard from you in awhile! Hope all is well with you, Nick and Amelia! I do like what I see so far, so definitely coming back for more!